Vehicles—We are now accepting donations of vehicles in all conditions. Learn more and fill out a vehicle donation form on our Vehicle Donation Page to get started. Electronics: Stereos, radios, VCRs, DVD players, etc. Furniture: dressers, tables, sofas, bed frames, (except waterbed frames) etc. To help you determine your donations fair market value Goodwill is happy to provide a “Value Guide” that offers average prices in our stores for items in good condition. It's hard to say "no thank you" to a donation when those donations help to fund Goodwill programs. 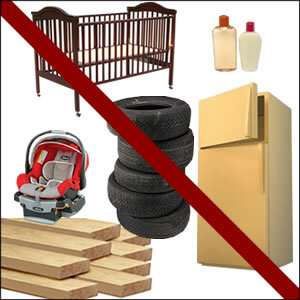 However, we do need to refuse some items for being non-recyclable or containing hazardous materials. Other times, the item must be refused because it costs more to transport, repair or refurbish than it can be sold for in our stores. Our donation attendants are trained to know what we can and cannot accept, and will help guide you to other possibilities for donations we cannot use. No household chemical products such as pesticides, paint, paint thinner, drain cleaner, oven cleaner, aerosols and other environmentally-unfriendly waste products. No automotive hazardous waste such as tires, lead acid batteries, additives, gasoline, oils, antifreeze, etc. No large appliances such as refrigerators, freezers, stoves/ovens, washers/dryers, air conditioners, dehumidifiers, furnaces, microwaves, trash compactors, water heaters, large console stereos, freon-based appliances, etc. No traditional recyclables such as glass, newsprint, office paper, cardboard, plastics, magazines, junk mail, etc. No weapons such as guns, bows and arrows, ammunition, hunting knives, etc. No cribs, car seats, walkers or other products that do not meet the current safety standards of the US Consumer Product Safety Commission, including recalled items.